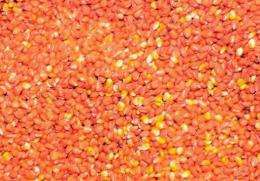 France's government on Wednesday asked a health watchdog to carry out a probe, possibly leading to EU suspension of a genetically-modified corn, after a study in rats linked the grain to cancer. Not having access to the study - I could be wrong, however it sounds to me like it would be the pesticide/roundup causing the cancer, rather than Maize NK603. Blaming GM food itself (rather than the additives) seems misleading. Or did I miss something? Heliocentric - yes you missed the description of the different groups of rats. It seems that either the corn or the chemical or the combination of both got the same results - tumors and other organ damage. GMOs are not natural and it is amazing to me that anyone would think that their ingestion by any living being would be benign. Look at the health of the American people to see the effects of eating GMOs. Nuf said. Thanks ariela72 - I did indeed misread this part "...The researchers found that NK603 and Roundup both caused similar damage to the rats' health, whether they were consumed together or on their own...". Whilst I am not a fan of how multinationals use GM plants for profit (i.e. use it to control/limit or sell additional pesticides with resistant crops) – this would be the first evidence I am aware of that it can cause health issues in humans. After all, we have been manipulating plants for thousands of years via selective breeding, GM is just faster. Let's hope it isn't reproducible. Problem with labeling GM is that when you buy chicken there is no labeling what the chicken was fed on. Same goes for all heavily processed foods. Maybe the food coloring on your birthday cake is based on corn syrup made from GM corn? That may show up in the label on the food coloring but probably not on the one for the cake. We really need GM-free zones. After all, we have been manipulating plants for thousands of years via selective breeding, GM is just faster. With breeding the changes are slow. So we find out if something is poisonous, or the poisonous side effect is so weak that we have time to adapt to it as a species as it grows with the wanted effects of the breeding. GM just makes huge jumps. It's not surprising that our bodies will find part of that hard to digest. And what the body doesn't digest it either has to sequester (in fat, liver or - if we're unlucky - in brain tissue). And if it's biologically active then that means cancer sooner or later. It's not about speed but about presence of various potentially toxic chemicals and proteins. For example the BT-toxin from GMO corn actually belongs to bacteria, which our immune apparatus always used to fight against. The low but permanent allergen concentration in food has a sensitization effect even for normal food components, because the correct function of biochemical pathways of adaptive immune system depends on temporary decrease of allergen concentration in reaction with specific antigen. If such decrease doesn't occur (for example because of human or bees are in permanent contact with GMO contaminated food every day), immune system continues in production of another various antigens, until their number and concentration isn't so high, they initiate an accidental violent immune reaction ("allergy") even in contact with proteins and various pollutants, which are harmless under common situation. After then the positive feedback is established under formation of permanent allergic reaction (chronic rhinitis, asthma or urticaria as an example).